The cables were released by the Wikileaks whistleblower website as foreign ministers from the eight Arctic Council member states - Russia, the United States, Canada, Denmark, Norway, Finland, Sweden and Iceland - met in Nuuk, Greenland, on Thursday to sign a treaty on international search and rescue in the Arctic and discuss the region's future challenges. The cables claim the Danish Foreign Minister Per Stig Moeller joked with the Americans saying "if you stay out, then the rest of us will have more to carve up in the Arctic". Greenland is an autonomous Danish dependent territory with limited self-government; however, the cables show that US diplomats believe Greenland "is on a clear track to independence" and see this as "a unique opportunity" for American gas and oil companies to get a foothold. The then-US Ambassador to Denmark James P Cain said in the cables that he introduced Greenland's government to New York financiers "to help the Greenlanders secure the investments needed for such exploitation". 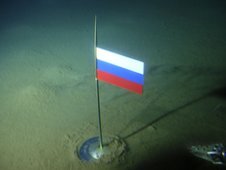 The grab for the Arctic accelerated in 2007 when polar explorer Artur Chilingarov used a submarine to plant a Russian flag on the seabed under the North Pole. The US cables reveal a senior Russian official told the Americans that this was a deliberate move by the Kremlin and that Chilingarov was "following orders from the ruling United Russia party". They also report comments by the Russian Ambassador Dmitriy Rogozin to Nato saying "the 21st Century will see a fight for resources and Russia should not be defeated in this fight". The US embassy cables also expose US concerns about Canada's territorial claims to the North West passage and to "seabed resources that extend to the edge of the continental shelf". They show that in 2008 the US embassy in Ottawa asked Washington to delay a new presidential directive requiring "the United States to assert a more active and influential national presence to protect its Arctic interests". Officials were worried that if it was released before the Canadian federal election the Arctic would become a big election issue and "negatively impact US-Canadian relations". 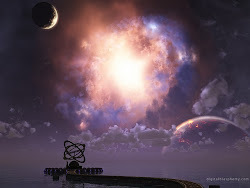 The directive was in fact delayed till after the Canadian election. The cables also report Canadian Prime Minister Stephen Harper telling Nato to keep out of the Arctic - an issue where he is in agreement with Russia. He is said to have claimed that some European countries without Arctic territories were trying to use Nato to give them "influence in an area 'where they don't belong'". Tom Burke, who advises mining company Rio Tinto and the UK Foreign Office on climate change and business, told Newsnight that political tensions were rising because "the ice is declining much faster" than expected, so "everybody who thinks they've got a chance to get at those resources wants to get in there and stake their claim". Since the 1970s, Professor Peter Wadhams of Cambridge University has made repeated trips under the North Pole in Royal Navy nuclear submarines to measure the thickness of the ice. He told Newsnight the graph "has gone off a cliff" because the ice sheet has thinned as well as shrunk. The Pan-Arctic Ice-Ocean Modelling and Assimilation System (PIOMAS) which measures ice volume shows that last September there was only a quarter of the ice in the Arctic that there had been in 1979. 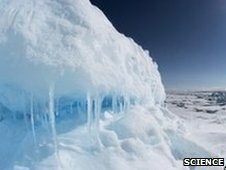 Prof Wadhams says in summer "it could easily happen that we'll have an ice-free North Pole within a year or two". British oil company Cairn Energy are in the vanguard of the Arctic oil rush. The company's commercial director Simon Thomson told Newsnight "we're leading the charge". Mr Thomson says Cairn Energy are "ahead of everybody else" in Greenland, but he knows the major oil companies are on alert saying "they're all watching and they're all waiting to see what we will find". He says that there is an awareness that although "it's a substantial prize", one big spill could endanger the whole Arctic oil project, therefore "we need to do what we do with an absolute focus on safety". However, the search for Arctic oil has been criticised by environmental campaigners, and Greenpeace protesters have already boarded a Cairn Energy rig currently heading for Greenland. "Instead of seeing the melting of the Arctic ice cap as a spur to action on climate change, oil companies like Cairn are rushing in to extract the very fossil fuels that caused the melting in the first place," campaigner Ben Ayliffe, who is on the Greenpeace ship Esperanza, told Newsnight. Some experts think that what is happening in the Arctic is like the Scramble for Africa in the 19th Century when European nations raced to secure resources. However, it is not just a race for oil and gas. Russia hopes that the Northern Sea Route will open up and allow northern European shipping to get to the Far East a third quicker than via the Suez Canal. New fisheries are opening up and Greenland in particular has mineral resources including aluminium and rubies.